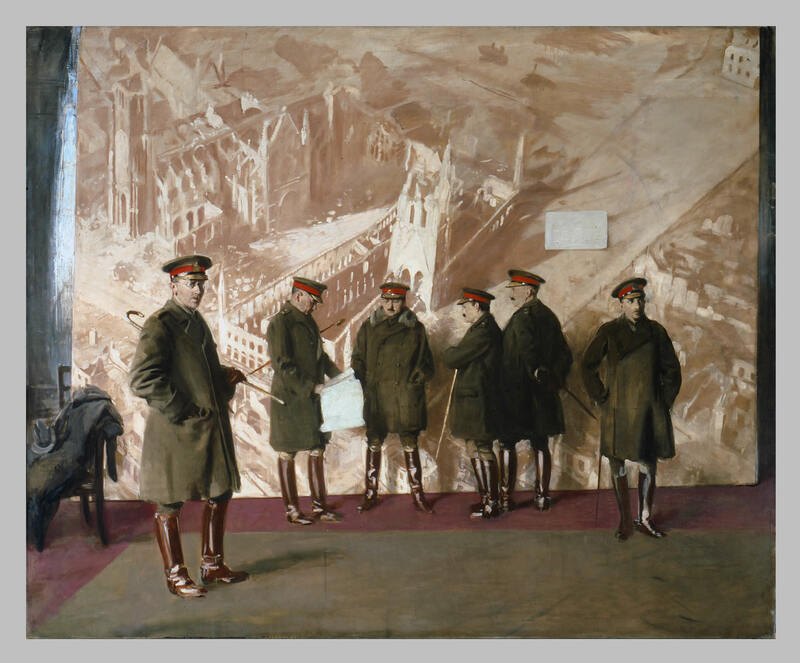 This painting by British artist Sir William Nicholson depicts five Canadian generals and one major of the First World War standing unposed in front of a mural of the bombed Ypres Cathedral and Cloth Hall. This unfinished painting originally commissioned by Lord Beaverbrook was quickly forgotten, only to be rediscovered in the vaults of the Canadian War Museum and later hailed as Nicholson's finest work. Nicholson captured the officers in the moments before they sat for an official portrait. Unconventional for the officers' less than heroic stance, it has been argued that Nicholson may have viewed his subjects with a measure of cynicism, possibly influenced by the death of his own son in the First World War.